Most of my Los Angeles, Beverly Hills, West Hollywood chiropractic clients know that I am a sports chiropractor. 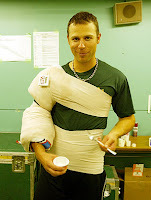 One of the injuries I see most often in my practice is a rotator cuff syndrome. Rotator cuff syndrome is a condition in which the small external rotator muscles of the cuff get weak. This weakness can lead to shoulder pain or a full-blown injury. A recent study presented today at the American Orthopedic Society for Sports Medicine at Keystone, Colorado has found that Major League baseball pitchers who show weak shoulder strength during the preseason are at a greater risk of developing throwing injuries and tears. The same rotator cuff muscles involved in pitching mechanisms are involved in our own everyday movements. We can therefore extrapolate these findings to non-athletes, primarily that weakened rotator cuff muscles lead to shoulder pain and injury. This is something I discuss with my shoulder pain clients often. Strengthening the rotator cuff is essential, especially for people who exercise. 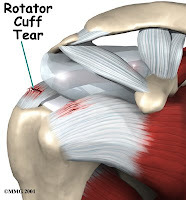 I see rotator cuff syndrome frequently in weight lifters (mind you, I’m not not speaking solely of body builders; I also mean everyday people who go to the gym for improved looks and health). When the average weight lifter strengthens what I call the “glamour muscles”–the pecs, biceps, triceps, and delts to name a few–and neglects the small stabilizer muscles (of which the rotator cuff makes up only one group), it’s like having a puppy run alongside 15 full-grown huskies in the Iditarod–it’ll get yanked and pulled all over the place. Ultimately, it will fail and break down. If you are having shoulder problems–pain while sleeping, lifting, or doing overhead movements, it’s imperative that you get checked out by a professional. If you are in Los Angeles, Beverly Hills, or West Hollywood, come see a sports chiropractor who can properly evaluate you, treat you to remove the shoulder pain and develop and exercise program to effectively strengthen your rotator cuff muscles. You’ll save yourself a world of hurt if you take prompt action.